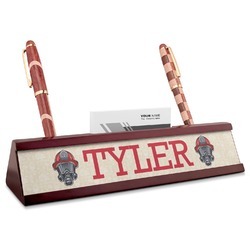 Add some style and high class to your work space with a beautiful dark mahogany colored nameplate. This will show your clients that you are a professional that cares for his / her customers. Elevate yourself at work! This wooden nameplate is a gorgeous dark cherry / mahogany color. It measures at about 9.5"W x 1.875"H x 2.5"D. The front is personalized with your name or whatever text you choose. The top of the nameplate has a small slot that will hold approximately 15 traditionally sized business cards comfortably. On either side of the business card slot is a pen holder that will hold your writing utensil upright. To care for your nameplate simply dust occasionally with a cloth. In our design center you will be excited to see all of the possibilities. There are graphics, background, fonts, and more to choose from. You can even upload your own artwork or logo to look even more professional. Even take the artwork from your own business card! Add exactly what you want the way you want it! If you get stuck or need help, just ask. Get a matching set with our wooden business card holder and sticky note holder. 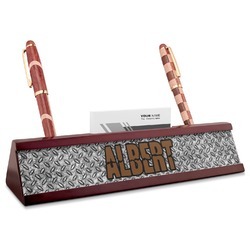 Check out the other great desk accessories in our Office section. We have mouse pads, cute sticky note cubes, leatherette padfolios, and more!